This easy-to-use, self-taking blood pressure kit is ideal for home use. 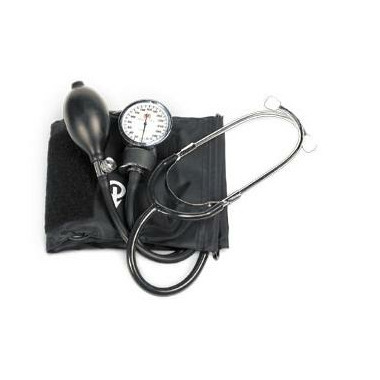 It features a certified no-stop pin, a 300 mm Hg aneroid gauge, a self-adjust D-ring cuff and a built-in stethoscope. Comes complete with vinyl zipper case, instruction booklet, and recording chart. Fits arms 10" - 16"
Bought 2 weeks ago. much accurate than digital. and well.ca is the only store carry those kind of professional grade . I ordered this BP kit on my doctor's suggestion to to random home readings. It is accurate, easy and very affordable. It appears to be well built (I've only had it a month) so I am expecting good durability over time. My only negative is that the stethoscope bell is in a fixed position. I understand why, but sometimes it would be nice to adjust the bell without moving the cuff. Overall a very good buy. Having had Quintuple Bypasses I check my B/P once every 7 days, and the service and product I received from Well.ca was truly outstanding. I'm very pleased with my first purchase from Well.Ca. AMG Self-Taking Home Blood Pressure Kit is as advertised. I'm still learning the finer points of using the manual model as opposed to the digital battery operated model.